LOS ANGELES, Feb. 20, 2014 /PRNewswire/ -- United Airlines today announced that it will introduce nonstop flights between its hub at Los Angeles International Airport and Melbourne, Australia, effective Oct. 26, 2014 (westbound), subject to government approval. The airline will fly the route six times weekly with Boeing 787-9 Dreamliner aircraft. United is the North American launch customer for the 787-9, and this will be its first international deployment of the aircraft type. "We are excited about using the newest version of the Dreamliner, the 787-9, to provide nonstop trans-Pacific service to Melbourne," said Jim Compton, United's vice chairman and chief revenue officer. "Our customers on these new flights will enjoy a more convenient itinerary, as well as improved inflight comfort and amenities. At the same time, we will seek to make changes to our Sydney schedule which will enable faster connections via our San Francisco and Los Angeles hubs from points throughout the Americas." Flight 98 will depart Los Angeles at 10:30 p.m. daily except Tuesday and Thursday and arrive in Melbourne at 9:15 a.m. two days later (all times local). On Thursday, flight 98 will depart Los Angeles at 9:30 p.m. and arrive in Melbourne at 8:15 a.m. two days later (all times local). The flights to Melbourne will not operate on Tuesdays. On the return, flight 99 will depart Melbourne at 11:15 a.m. daily except Thursday and Saturday and arrive at Los Angeles International Airport at 6:50 a.m. the same day. On Saturday, flight 99 will depart Melbourne at 3:15 p.m. and arrive in Los Angeles at 10:50 a.m. the same day. The flights to Los Angeles will not operate on Thursday. Flying times will be approximately 15 hours, 45 minutes westbound, and 14 hours, 35 minutes eastbound. United has timed the new flights to conveniently connect at Los Angeles with an extensive network of service throughout the United States, Canada and Latin America. United and United Express jointly operate nearly 200 flights daily from Los Angeles to more than 65 destinations. With this new service, United will provide convenient one-stop service to Melbourne from more than 37 U.S. cities. 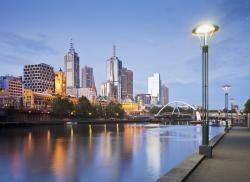 With the launch of nonstop Los Angeles-Melbourne service, United will end service between Melbourne and Sydney. The airline will seek to retime its daily departures from San Francisco and Los Angeles to Sydney in order to allow a greater range of connections beyond the hubs and to provide more convenient arrival times for customers on connecting flights from Sydney to New York and other East Coast destinations. The Boeing 787-9 aircraft operating the new Los Angeles-Melbourne service will offer a total of 252 seats – 48 in United BusinessFirst and 204 in United Economy, including 63 Economy Plus seats with added legroom and increased personal space. United BusinessFirst offers a superior business-class service. The BusinessFirst flat-bed seat reclines 180 degrees and features an on-demand entertainment system with touch-screen monitors. BusinessFirst amenities include power outlets, USB ports and multi-course meals with complimentary premium wines and spirits. Economy Plus seats offer up to five inches of extra legroom, and both Economy Plus and United Economy seats feature adjustable headrests, power outlets and personal seat-back monitors delivering a multi-channel inflight entertainment system on demand. The 787 Dreamliner is revolutionizing the flying experience for United customers and crews while delivering unprecedented operating efficiency, comfort and lower emissions. Customers experience greater comfort with improved lighting, bigger windows, larger overhead bins, lower cabin altitude and enhanced ventilation systems, among other passenger-friendly features. The aircraft's use of lightweight composites, together with its modern engines and improved aerodynamic design, allow it to fly farther, faster and more efficiently than similar-sized conventional aircraft. United is the 787 North American launch customer and now has nine Dreamliners in its fleet. The airline has a further 56 Dreamliners on order and expects to take delivery of five more from Boeing, including its first two 787-9s, by the end of 2014. United started service to Australia in 1979 and today operates more flights to more destinations in Australia than any other U.S. carrier, with daily flights from its San Francisco and Los Angeles hubs to Sydney and Melbourne and twice-weekly service to Cairns from Guam. The airline will begin introducing Boeing 777-200 aircraft to replace Boeing 747-400s on its trans-Pacific services to Australia at the end of March 2014. United Airlines and United Express operate an average of more than 5,300 flights a day to more than 360 airports across six continents. In 2013, United and United Express carried more passenger traffic than any other airline in the world and operated nearly two million flights carrying 139 million customers. United is delivering a more flyer-friendly experience, offering more premium-cabin flat-bed seats and extra-legroom, economy-class seating than any airline in North America. In 2013, United became the first U.S. global carrier to offer satellite-based Wi-Fi, including on long-haul overseas routes. The airline also features DIRECTV® on more than 200 aircraft, with more live television access than any airline in the world. United operates nearly 700 mainline aircraft and, in 2014, will take delivery of 36 new Boeing aircraft and welcome the E175 aircraft to United Express. Business Traveler magazine awarded United Best Airline for North American Travel for 2013, and readers of Global Traveler magazine have voted United's MileagePlus program the Best Frequent-Flyer program for 10 consecutive years. Air Transport World named United the Eco-Aviation Airline of the Year Gold Winner in 2013. United is a founding member of Star Alliance, which provides service to 195 countries via 28 member airlines. More than 85,000 United employees reside in every U.S. state and in countries around the world. For more information, visit united.com or follow United on Twitter and Facebook. The common stock of United's parent, United Continental Holdings, Inc., is traded on the NYSE under the symbol UAL.